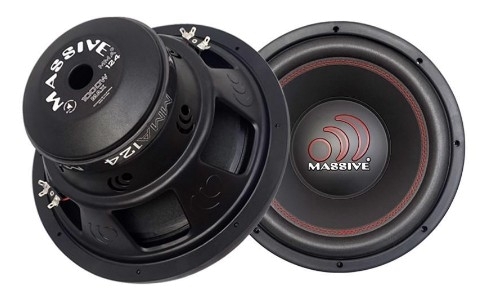 Massive Audio - MMA124 | MMA124 | Subwoofer | Toms-Car-Hifi - Kaufen was Freu(n)de macht! Massive Audio’s MMA subwoofers can handle a “Kilo” of power. 1000 Watts! and in the properly tuned box play as low as 35Hz! You see the heavy gauge steel stamped baskets are painted to lower resonance and to protect. High Flux Y30 Ferrite Magnets, EISV Voice Coil’s made with aluminum former and poly cotton spiders with woven round tinsel leads are all balanced with laminated paper cones using a pressed foam surround stitched in Red then all bolted together to form Massive Audio’s MMA series “Killer Kilo” subwoofers.